While you have been preparing for your trip, you have no doubt asked yourself what you can eat in Iceland. Well, cuisine in this country has two basic pillars: fish and meat. There are also some dishes containing vegetables and dairy produce. 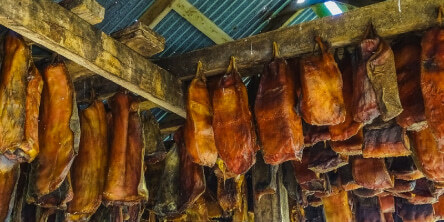 The majority of traditional dishes eaten in Iceland are preserved, and may be fermented, marinated, smoked, dried or salted. Food which has undergone the drying process, or Purrkun, is the most abundant. On the other hand, fish is undoubtedly the star of Icelandic gastronomy. Whether salmon, shark, cod or herring, it is included in soups, meatballs, salads, stews and even aperitifs. But, let’s have a more detailed look at the traditional Icelandic dishes that you can try during your trip. This dish has an almost unpronounceable name and is made with dried fish, normally cod. It is eaten spread with butter and is one of the most traditional dishes of Icelandic cuisine. Icelanders are practical cooks, so you will be able to find this fish dish vacuum packed in many supermarkets. Fish, potatoes and onion are used to make this traditional Icelandic dish. They are boiled together to make a stew which is well-known and popular throughout the country. Apart from the above ingredients, it also contains butter, milk, flour, salt and pepper. This is the perfect dish to warm you up and to savour the succulent Icelandic food. Continuing with fish, we move on to shark. To make this Icelandic dish, shark meat is fermented for a month and a half at least. Once the fermentation process is complete, it is dried and, once dried, it is ready to eat. The shape is reminiscent of the traditional Spanish pork trotters, but don’t be confused by this, it has a very strong flavour, even for the most accustomed Icelanders. If you are not afraid to try new things, you may be brave enough to try this Icelandic invention consisting of a cake made of macerated ram’s testicles. These are cut into slices and are served in a type of soup or broth. There are opinions both ways on this dish, so you will only know if you like it or not by trying it for yourself. This is a combination of different types of dried, smoked meat. It is served cut into slices or pieces and is eaten as a buffet food, in the same way as Spanish cured meats. It is part of a fish and meat starter. You may find anything from whale meat, to beef. The taste depends on the variety of meats used. Another traditional Icelandic dish to rebuild strength is a soup of vegetables and mutton. This is made with cabbage, carrots, onions, potatoes, turnips and the joint of mutton. To flavour it, parsley, thyme, bay leaf, celery and salt are used. All the ingredients result in a very tasty soup to be eaten in winter. Mutton, as we mentioned earlier, is one of the basic foods of Icelandic gastronomy. In this case, to prepare the Svie, a boiled sheep’s head is eaten accompanied by a puree of potatoes and turnips. This is the name given to hot dogs in Iceland, that is, they have their own particular way of preparing them. With little predisposition to invasion by other cultures, Icelanders have allowed this snack into their kitchens. They prepare it with mutton or pork meat and serve it accompanied with raw onion, Lombardy cabbage and mild mustard. This Icelandic dessert consists of yogurt whose texture and flavour is very much like fresh cheese. It used not only used as a pudding or as a snack, but it also accompanies dried fish dishes. To make it, skimmed milk is used, to which blueberry conserve is added. It is delicious, so much so that it is eaten beyond the country’s borders. Other traditional Icelandic desserts are pancakes, known in Iceland as Pönnukökur, and the Slöngukaka, a chocolate cake that you will want to eat at any time. The Brennivín or burning wine, is the traditional Icelandic drink. Its main constituents include fermented potatoes, to which are added cumin and caraway seeds to give it aroma. This strong-flavoured alcoholic drink is 40% proof, so if you try it, do so in moderation. In relation to drinks, you should also try some of the Icelandic beers. The Brío and Boli beers are the most famous and recommended ones. Now you know what to eat in Iceland and which are the main traditional dishes. Don’t forget to discover new flavours during your trip, as this is also part of the experience.